Welcome to the 2012 News Archives! 2012 - A year of Great Accomplishments! Bazingo - Sea Lion Amputee Back in the Wild! Golden Missy - Fur Seal Trippin'! Olympus - An Olympic Rescue! Bandicoot & Vault - Two Cute Sea Lions Share a Cuddle! Steven Sealberg - Back to the Future! Evader - Entangled Sea Lion Evades Us No More! 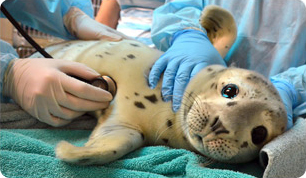 Pinnipeds Return to the Wild! The Beard - Fear the Beard! Puptart - An Itchy Situation! Al Catraz - Escape from Alcatraz! Mr Elusive - Two Years in the Making, this Entangled Elephant Seal is Finally Free! Rascal - Welcome Home You Little Rascal!